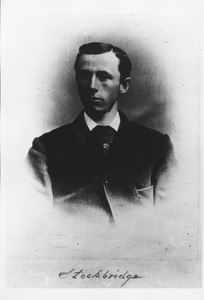 Photographed copy of a formal portrait of Horace E. Stockbridge (Class of 1878), who briefly joined the Chemistry Department as Assistant Professor before accepting a position of Professor of Chemistry in the Imperial College of Japan. 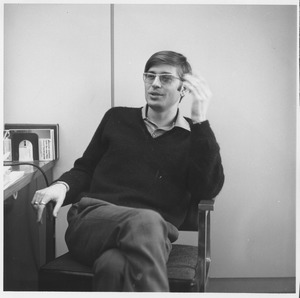 Paul Theroux gestures while speaking in an office next to a desk piled with papers. 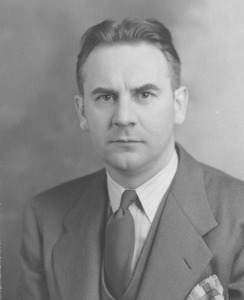 A well-known writer, he graduated from UMass with a B.S. 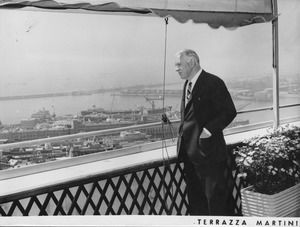 in 1963. 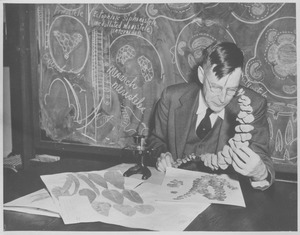 Professor Ray Ethan Torrey of the Botany Department sits at a classroom laboratory table while examining a plant. A microscope and several papers with pressed specimens sit on the table while a blackboard sports diagrams along with botanic terms including 'mesarch meristeles' and 'Ectophloic Siphonostele'. 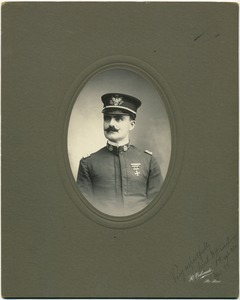 Formal portrait of Oswald Tippo during his time at the University of Illinois. 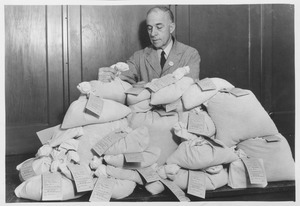 "O. Tippo 1952" written on back. 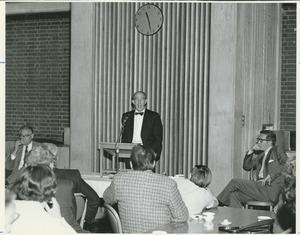 Candid picture of Ellsworth "Dutchy" Barnard, Instructor of English 1930-1934; Professor of English 1970-1973. 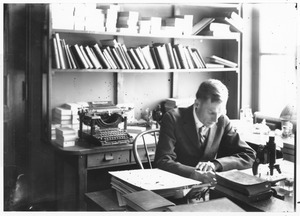 Professor Ray Ethan Torrey of the Botany Department sits at a work desk in his office with various books, boxes and a microscope on hand. 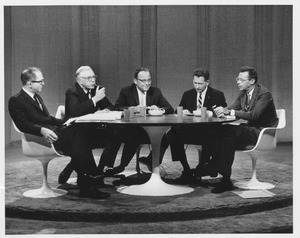 A Remington Standard Typewriter No. 10 sites on a table behind him.